Damian Rodgett studied film, video and photographic art at the University of London, before winning a Nipkow Programm scholarship in Berlin to produce one of the first interactive storytelling experiments in Europe. He is the producer of numerous cross-media projects, interactive games, websites, online campaigns and communities with Terratools (Babelsberg), Scholz and Friends (Berlin) and Pixelpark (Köln). 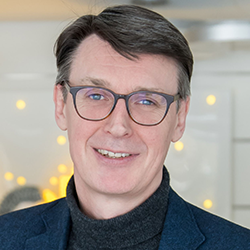 Rodgett joined pilot (Hamburg) as creative director and managing partner in 2000 and developed the company into one of Germany’s leading digital marketing agencies. He founded pilot Screentime in 2012, with a focus on digital signage and creating digital brand experiences. Known for his distinctive creative and innovative approach to developing communication, content, advertising and technology solutions for the advertising and entertainment industry, he has been recognised with many advertising awards. Rodgett is also part owner and managing director of Panik City (Hamburg) – a multimedia experience that showcases the life of Udo Lindenberg in a spectacular 90 minute show.